Over the decades, the NBA has given us innumerable legendary commercials such as The Showdown with Magic and Bird, I’m Not a Role Model with Barkley or any of Jordan’s numerous commercials. However, various NBA stars have also treated us to just as many cheap, silly and outright weird car commercials. 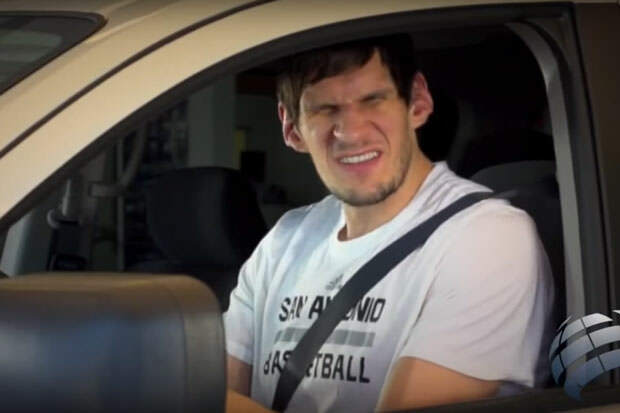 Often the ads in question are local ones they made for small companies before they became famous, which is exactly the case with the commercial that inspired this article – the one with Boban Marjanovic and Danny Green of the San Antonio Spurs, doing a spot for something called World Car, which is a salon of sorts or something like that. It really does not matter. The only thing that matters is Boban driver-dancing to some 90s Euro techno and exclaiming that “This sound system is AWESOME.” The whole thing is pure joy. However, like we said, it is hardly the first cheap and exciting car commercial featuring an NBA star. The first of these, and let’s be honest, the greatest of them, hails all the way back to 1966 when Wilt Chamberlain did an ad for Volkswagen Beetle. The point of the commercial was that while Wilt couldn’t really fit into it, his teammate Billy Cunningham who was “only 6’6”” easily could. Also, who could forget the Eastern Motors commercial with a number of D.C. area athletes, such as Kevin Jones, Brendan Haywood, LaVar Arrington and Carmelo Anthony, lip-synching along one of the catchiest tunes ever put into a commercial. Nothing but that tune matters. Not even how out of the place Carmelo looks in that ad. A few years ago, another Spurs guard-center duo did a car commercial, this time for Northside Ford. It is almost painfully obvious that Tiago Splitter is nowhere near as good of an actor as Boban is and Gary Neal‘s acting is simply cringeworthy. The commercial is pretty weird even without their lame delivery, with a bunch of teenage girls (a basketball team coached by Tiago?) jumping in the car with Gary. They didn’t really think this one through. Oklahoma City Thunder players also did a fun little car ad a few years ago, with Reggie Jackson, Kendrick Perkins, Serge Ibaka and Nick Collison inhaling helium and doing the whole squeaky voice thing. Reggie’s laughter is just too adorable.